Founded in 1968, the Sunriver Nature Center & Observatory is a privately funded non-profit organization committed to the study and protection of ecology and the natural setting of Central Oregon. Our mission is to inspire present and future generations to cherish and understand our natural world. We serve more than 45,000 visitors annually and provide over 600 natural science and astronomy programs in the classroom and on site each year. With our live birds of prey, reptile-amphibian ambassador program, interactive exhibits, beautiful nature trails, botanical garden, and the nation’s largest public viewing observatory, our staff has may opportunities to engage and intrigue our visitors and patrons. Our unique organization also houses a nationally recognized research program on local amphibians, including the endangered Oregon Spotted Frog. $40 provides one month of food for our golden eagle. $50 provides one scholarship for an environmental education program. $75 provides crickets for our reptiles and amphibians for one month. $100 provides perch material for six raptors for two months. $150 provides one month of mice for our owls, hawks and snakes. $200 provides one year of food for swans Chuck and Gracie. $300 a year provides housing, heating, and lighting for our reptiles and amphibians. $500 a year provides medical supplies for injured wildlife. $1000 provides support toward the creation of 15 interpretive trail signs. $2000+ helps us build new, enriching homes for our bird of prey ambassadors. 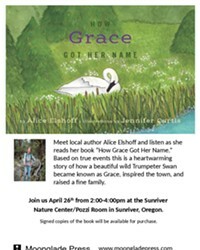 Stop by the Sunriver Nature Center to learn more about how you can help! Fri., April 26, 2-4 p.m.